you might remember back in September I mentioned the new Anna Sui nail polish bottle design. Since then I have been dying to get my hands on a few of these lovelies. Recently, with the help of a couple dear friends, my wish was realised. Now I have a small Anna Sui dress bottle army, yay! Here is a better look at all the colours. The bottles look gorgeous and as expected of Anna Sui all the colours are very interesting and quite unique. Of course I had to try the purple one that I got from my friend Moni, first. It is Anna Sui nail color N #210. A beautiful royal purple that applied perfectly after two coats. I used a coat of Anna Sui top coat for quick drying and to preserve the lovely rose smell. When I first saw the bottle design, I was wondering if it would be easy to handle but this was not an issue at all. Purple is one of my favourite colours and this nail polish did not disappoint me. Perfect coverage with two coats and with the help of the top coat it lasted for quite a while. I had this on for 4 days before changing it and had no tip wear at all. 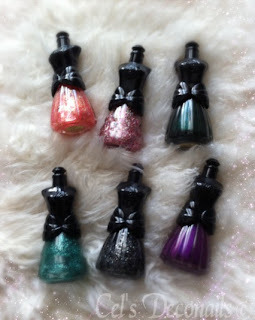 Have you tried any Anna Sui nail polishes dear readers? Which one is your favourite? Do you like the new bottle design? Anna Sui polishes always have such nice coverage, pure love! i said the bottles are so cute !!! Hehe thank you my dear ^_^ Anna Sui makes the cutest nail polish bottles. Too bad we cannot find them in Europe easily. I like all her bottle designs so far. I am not sure if the dress bottles are here to stay though. 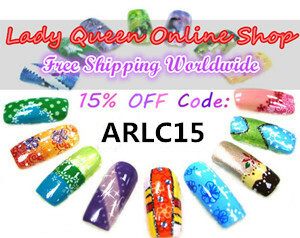 Yay, thank you ^_^ I will make more nail looks with these soon! I love these bottles! I've always been a huge fan of decoratively packaged cosmetics. And the polish colors are pretty too! I'm with you on that one. Cute packaging is definitely a huge plus!